We'll certainly be back again sometime. We thoroughly enjoyed our 3 days cruising on The Shannon. This was the first time helming a boat for us. Carrick Craft were very caring and efficient. We were pleased to be able to collect the boat earlier than we thought on the Saturday and we were delighted with the boat. It was clean, comfortable and well equipped. The only thing we didn't have was a corkscrew. When I mentioned this to a Carrick Craft staff member he went to fetch one for us. The waterways are a joy to experience and there's such a variety; from canals to rivers to enormous lochs. The large map we were provided with was excellent. We'll certainly be back again sometime. The service was excellent and we had a great time on the river. Everything was straightforward. So no lows all highs. We were lucky enough also to get a reasonably good week weather wise to fully enjoy the trip. I recommend Shannon River Boat Hire to anybody who wants to rent a boat in Ireland. "Very quick response time and good understanding of my needs. I was impressed by your knowledge of the availabilities and the boats - and your advice (like taking the train instead of the bus) which saved me some money. As a former travel consultant of KUONI travel, I might belong to the very demanding clients. I enjoyed this exceptionally professional and positive experience with your company. The boat was perfect for us (Lake Star) - and the second steering wheel was highly appreciated - actually it would not have been the same good experience if we would have needed to steer the boat from inside all the time. This was a very good recommendation which you gave me on the phone - and I would not rent a boat which can only be steered from the inside. We also very much liked the design of this boat - extremely well for a family with 3 children and 2 adults. Everything worked well in the boat, even the fridge. The only recommendation: some better knives for cutting (we used our swiss army knife ??) - and we already told that to the people at the wharf. The 8 or so towns that we visited provided endless entertainment and memories. We had a fabulous time . We had a fabulous time . 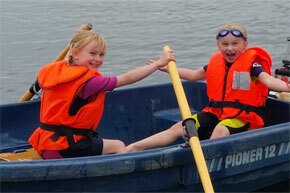 Boat hire people very good and boat good size for 2 (Horizon 1). Managed to get in the Cottage Restaurant at Jamestown which was great. All in all, a very enjoyable and memorable holiday. The staff at Carrick were fantastic, the lockkeepers were pretty good too, can't say the same about the weather!!! Not your department tho! I am not sure whether this is your department either but are you responsible for the navigation buoys/routes? Having studied the detailed chart of Lough Ree, and on a windy day, we ignored the marked route and hugged the lee shore instead, deep enough and calm but it looked to be very uncomfortable out in the middle. Thank you, we'll come again. Yes indeed, we had a wonderful and most relaxing week. Even the one very wet day that we experienced failed to dampen our enjoyment! We opted to go north out of Carrick and, over the next few days, travelled as far as Geaglum (lunch stop) while overnighting at the Crom Castle moorings and taking in a bit of shore time on the Castle grounds. On the way south we diverted for a night up as far as Acre Lake, Drumshanbo. When we arrived on the first day in Carrick we had a great lunch in The Oarsman, so much so that we booked in for dinner there on the following Friday night when we returned to Carrick. That was a spectacularly good dinner with superb service so, thanks again for the recommendation. It was a brilliant finish to our week. Overall we were very happy with Emerald Star – there was only one minor hiccup and that was that the pre-ordered BBQ wasn’t on board when we took over the boat and it delayed our start by about 40 minutes. We would certainly be tempted to cruise the Shannon/Erne again – particularly to spend time on the two Lough Ernes, but I suspect that we would have to start our week from a more northerly point to allow plenty of time to explore the lakes. We're glad we took the Lough Erne route. We had a fantastic time and would love to do it again some time. We got as far as Kesh on the Lower Lough and then returned down the other side of the Lower to the river and down to the top of the upper Lough and back up to Ballenaleck. We stayed the first night in Enniskillen at the Forum, the second night at Kesh and the third night at Carry Bridge. We're glad we took the Lough Erne route. My father absolutely loved it and he's talking about doing it again next year, although on a route further down the country. Thanks for all your help in picking the route. It was great! Thanks for everything Brian! Check in was super smooth. Pack had everything we needed. We were already planning 2019 when we were leaving on Sunday. If I was to offer one piece of feedback, it would be great if there were large bins left somewhere onsite in Carrick so we could get rid of our rubbish on the Sunday. But to be honest we are nitpicking. Brilliant trip and would highly recommend to anyone. We had a great time cruising down the Shannon. Pity the weather wasn’t a bit better but it didn’t stop us enjoying ourselves. It was just such a relaxing holiday. We had such a good time - loved it and hope to do another trip some time - either Ireland again or another country perhaps. Thanks for your note, yes we had a great time traversing the Shannon Erne waterway. Your help and the efficient service at the boatyard made for a super vacation. Hope to do it again sometime. We had a great time on the river. the only downside was that the boat was a little bit too small for me as I'm 6 ft 7, but that's not your fault :D everything else was perfect. Thanks again for organizing everything. can definitely recommend your company and spending some time on the river. We had a great time on the Shannon. The Carrick Craft staff were great. They were friendly and very helpful. We would definitely recommend this company. Yes we had a fantastic time on the river Shannon and Erne. My Grandson loved the locks ( even though they WERE automated ), so we went up and down a few times???! Everything went well and I'd like to thank you for all your help with our booking. Yes we had a fantastic time and we’re looking forward to getting back again next year. Every part of the cruise was excellent including the boat, the people we met, the places we went to and the pubs/restaurants we visited. Thank you. We did have a wonderful time. We were fairly fortunate with the weather. We were very happy with the boat and its facilities and the prompt, efficient back-up when we lost power due to a snapped cable. The scenery and birdlife are also amazing. We hope to do it again,perhaps next year. Thanks again for all the prior information - it was very helpful. Wonderful holiday and appreciated the great service in getting us on the river – very helpful and prompt responses to our many queries! Will ask Robbie to send on some photos – we had a few amazing days on Lough Derg and enjoyed fabulous sunsets in Terryglass. Thanks for the e mail. Everything was great, thanks. The only comment I have is the beds are not the most comfortable and the boat (Consul) we were on could probably do with a bit of freshening up, especially in the sleeping cabins. Other than that, its a great break and experience. The boat trip was great thanks very much for your assistance. We look forward to booking through you again next year. Myself, my wife and two friends picked up our boat in Carrick on Shannon at the appointed time. Everything went as you indicated when I agreed the deal with you. Arrived at your depot ‘ 12.30 pm and met by a very courteous woman, who provided all the boat details and documentation as well as accepting the agreed money. She pointed out training would not be available before 2pm but we could bring our personal things onto the boat before then. She also advised on the most suitable restaurants. Training was provided from 2 pm onwards and trainer accompanied us out for a short journey. All very satisfactory. The trip went very well and we managed to cruise as far as Lanesborough and overnighted in Rooskey and Tarmonbarry. The Consul was not the most ideal model of boat for us as it has too many steep steeps when getting on or off and moving from room to room. We are all in our early 60’s and the extra climbing is hitting our limbs hard this week. Also we felt the boat is too small for 4 adults, particularly the toilets/washrooms. My wife and I had the en suite bedroom at the rear of the boat and were very disappointed with the bed linen. The duvet and its cover had the smell of diesel fumes and did not feel to have been freshly laundered. Access to the bed was also difficult for us. Our friends sleeping at the front had a better experience and had no issue with their bedding and linen. No issue with the kitchen or cooking facilities. The quality of the cutlery etc was excellent. All locks was negotiated successfully and lock keepers were courteous and help full. Found great restaurants in Dromad and Tarmonbarry, however Dromad Mariana had no space for us to berth and we had to progress to Rooskey and resulted having to take a taxi back to Dromad for our meal. Overall our experience was positive and we will be going on further cruises, however a more ‘flat bottomed’ boat will be sought the next time. We had a wonderful break for the few days. We have been discussing doing it again next year!! We had inquired about the break very late and you were able to pull together options for us which was great. We found your website very good to use to plan our trip in terms of distances between towns and facilities in each place. We will be back on again once we finalise dates for 2019. Will definitely stay longer when we come again! We had a very nice stay on your boat and will definately stay longer when we come again! Your technician was also really friendly and did not hesitate to come and help us when we were having a problem while he was having dinner. Next time we will see to rent a bit better weather though. ;) But when the sun did come through, we were indeed able to sake some nice shots, some of which i attached. Everything was perfect. We really enjoyed ourselves despite the weather not being great. Thanks a million and will recommend your site to friends. I honestly could not be more delighted with the way everything went on our boat hire. The boat was in fabulous condition and extremely clean. Everyone was friendly and seemed to appreciate our business. The available stops on the river and lake were amazing and we were delighted to see our own family name on the first grave we found. Turns out many Flannagan’s came from this part of Ireland. We hadn’t really researched too much on our Irish roots and it was a pleasant surprise to stumble upon so many Flannagan’s! Yes, we all had such a good time and enjoyed our time on the boats a lot! Everything worked out well, the transportation, boats etc. Thank you so much for all your help and patience with my questions … I only realized later that half of my questions would have been answered, if I would have actually read the Captain’s handbook earlier ?? Great service all round, from everyone, boat was ideal for us. Only glitch was on the last evening when a mechanical malfunction caused the top controls to fail. Would do it again, a great way to see the countryside and some beautiful villages. Absolutely marvellous . Absolutely no complaints. Thank you we had an absolutely marvellous couple of days on your boat on the Shannon. The boat was well fitted out and had all the basics that are needed for a few days on the river. Absolutely marvellous . Absolutely no complaints. Most importantly your staff were so helpful and so courteous - when we arrived explaining all about the boat and when we returned finalising matters and getting us on our way. They were all friendly, efficient and competent. Thank you so much. This wasnt our first time on the Shannon and certainly wont be our last. We had a wonderful couple of days. - our boat was a 6 berth boat. We were provided with 6 single duvets but only 4 single sheets. The single sheets don’t fit the double berths so we had to use 2 leaving us short for the remaining berths. I would recommend either providing 4 single and a double or 6 single sheets. - we had a bow line and a stern line but no spare sheets (ropes) were provided. We got our bow line caught around the propeller. We got it free but in the interim had no spare ropes to tie up the boat. A neighboring barge loaned us one. The ropes provided also weren’t long enough in many cases to provide a good spring to keep the boat in place. As I said, we had a great 3 days and the comments above are only to assist and not to detract from a super service! Many thanks - we will be back! I would just like to say that we had a fantastic experience on the Shannon River Hire. Everyone on the boat thoroughly enjoyed it and everything we needed was on board which was great. The staff we met on the day were fantastic and ensured we were comfortable with everything before we set out. For our first experience on a trip like this, it could not have went better. I'll be recommending Shannon River Boat Hire to everyone I know, and I look forward to booking again with you in the future. Thanks again for all you help. I just wanted to drop a note to say we had a great time on the boat and it is a trip I will recommend to others. It's a unique way of seeing Ireland. We had a great experience on the River Shannon last week. It was really relaxing and a great way to unwind. It's a unique way of seeing Ireland. We found Carrick Craft exceptionally helpful and easy to deal with when necessary. However, we did have a very negative experience with one private boat owner in Shannonbridge. We were unaware of the issues between private and rented boats on the River Shannon. There is a need for more understanding between the two parties. Perhaps it would be more beneficial to have separate mooring spaces for rented boats if Waterways Ireland were agreeable. Some private boat owners were exceptionally friendly and helpful when mooring, yet some were rather hostile toward our rented status! There seems to be a loophole for private boat owners to exploit the liability involved in driving a rented boat. I'm sure you are already aware of this issue but we thought we would highlight it. Overall, we had a lovely week and would definitely do it again! Had a ball. I just enjoy being on the water so was never going to be any other way. Myself and the girls had an amazing time. It was a fantastic experience from beginning to end meeting the most helpful people from the lovely guys at Carrick Craft to the men on the locks and waterways and also the regular cruisers helping us dock. Everyday was an adventure with laughter and fun topped with the kindness we encountered on our way. You haven't seen the end of us, its the beginning of a whole new way of seeing our beautiful island so many many thanks for all your help, truly appreciated. We had the best holiday possible. We had the best holiday possible. All went well and we anticipate another river trip in a year or so this time going north. Thanks for all your help. God bless Ireland. We had a great trip... thanks for all your help and advice. I’ve given your info to two friends who may go next summer and will contact you. We had many positive experiences on the River. Our three teenagers really enjoyed the experience of being on a boat; Lough Derg (where we spent the bulk of the time) was beautiful and we really loved being able to stop off and appreciate the small towns, villages and great pubs on the Lough banks. The explanation we received on the day we took the boat was excellent. Well given, lots of detailed explanations and very well articulated. We gave detailed feedback on the boat itself the day we returned the Gowna. We had a couple of very practical challenges. The double pull-out bed broke (with one of our two younger children) on it during the third night of our 5 nights. The mechanism for holding it in place was not strong enough we felt for the two children (though it is slated to be a double bed). We managed the trip but we had one night of very disrupted sleep as we tried to put it back together and make sure the kids were fine -- no injuries thankfully. The boat itself just seemed quite well-worn and used. For example, a number of the windows in the back cabin did not close -- either insufficient oil or worn out -- with the result that we had a lot of bugs of various descriptions in the cabin at night. In the kitchen/living room area the floor covering was peeling off from the sides - making door slide from the bathroom a challenge. We gave feedback on other small but unnecessary maintenance issues. As we noted in our feedback form, our family loved the river and the experience, but the boat we had given to us was functional but a little too well used, and really needs a fairly substantial overhaul to make sure that all parts if it are functional for any future users. We had a fabulous holiday in the Shannon. The information and video links that you sent on were very useful to help prepare for the trip. The boat was excellent and everything went very smoothly from the booking with yourself right through the entire trip. Thanks Brian for your help. You were so helpful and all the attachments and information set us up. Carrick craft were also very good to us. We definitely recommend your company and will book through you again. We plan to book again early next year. This time we will book a larger boat and for a week. It was our first time for this type of holiday and we learn s loads for future planning. Thank you very much again from us all and I'll be in contact with you soon again for future bookings. The experience was great we all really enjoyed it. Your staff were very welcoming, helpful and friendly, I filled in the survey before we left and name a couple of individuals whom we dealt with that were very friendly, helpful and accommodating. We will definitely be back – maybe a slightly bigger boat next time as the boat worked, but was a little cramped for 5 of us. Our time on the river was most enjoyable. The Tyrone class boat was everything it said on the tin. It offered comfort while economising on space. The Carrick Craft staff could not have been more friendly and helpful. Evenings in Dromod (Cox's) and Carrick (Oarsman) were great fun and great food. The whole thing was a really good experience. Everything was perfect. I don't have any negative comments. The map book told us everything we needed to know. It's definitely something I'll be doing again. Thank you for all your help in organizing the trip. It went really well and the lads enjoyed it very much. We all agreed it would be fun to do again but maybe with a bit more space next time. It was fine for a first trip and the boat was easy enough to maneuver. The staff at the marina were great and everything went smoothly and as planned. Thanks we all had a great time, will definitely do it again and would highly recommend your service for a trip away! We had a lovely week on the Shannon – helped by the amazing weather of course. We enjoyed going through the locks and found the river and Lough Erne to be very quiet with few other boats doing the same route as ourselves. We saw several kingfishers, an eagle and lots of other less unusual birdlife. I have attached a couple of photos we took. Everything went very smoothly and our taxi ride from Bellanaleck to Carrick was very enjoyable, so thanks for organising that for us. We had a lovely time thank you, Staff were efficient and helpful, and very pleasant. We were blessed with good weather too! Great time Brian would definitely cruise again. We had a great cruise and as you probably know incredible weather. Many great memories were created on the water and in the various towns. Everyone at Le Boat/Emerald Star was helpful and accommodating at both ends. The boat (Caprice 20) was in good shape when we took control of it. The orientation by John was very good and he did a great job of assessing our skill level and experience with boating. The only feedback on the slightly negative side was that when we spoke with you earlier in the year you told us no problem to get bikes on day of departure; however, there were no bikes available at Carrick-on-Shannon. The good news is that Le Boat made it right by delivering us bikes in Athlone, halfway through the trip, and did not charge us. Michael felt the service all round was Excellent service all round and he had a fantastic time. He looks forward to booking with you again. The only minor comment I’d have is maybe some sort of template checklist for the things that are in the boat and the things you’d need to get at supermarket. Things like washing up liquid, salt, pepper etc. . .
We are extremely satisfied with all service. The boat was great and very clean, your staff very friendly and knowledgeable. We have had a very nice time on the Shannon river. On lough Ree we had a 4 till 5 windy Beaufort, and we did not know anymore or it was of the good Irish Guinness or by the waves, but pictures showed us afterwards perfectly that it was… the very strong Irish wind, blowing (y)our boat very perfectly on it’s side…(!). Water came in…. . So we are still going from the left to the right side, even up and down, still walking around…. . So we remembered and spoke during hours, during that "little" Irish storm, with Your Irish St-Patrick and with his Big Boss, our Jesus, remembering His storm on the lake of Galilea, with his apostels, (just as we are), who begged Him to calm the wind. WE RECOMMEND strongly to float on the so beautiful Shannon. The Irish flag (we bought at the beginning) and that was proudly waving at the back on (y)our boat at the back on the top. First of all,the people who works on carrick craft are very nice and helpful, so we feel very well at this company. The weather couldn´t be better, we had only about two half days with rain,the rest was very nice weather. Maybe it was not so easy to drive a boat if you dont made it before but at the end oft the week it was better. The teaching at the beginning was very nice but difficult because it was only in English. All in all it was a beautiful holiday in my lovely ireland and maybe I came back sometimes with a group of friends, and the i am sure I come to your company. Just a quick message to say we're back on dry land and its not half as much fun! We returned the boat yesterday and back at work today! We had an absolute ball and 3 days was not enough. We already want to go again! Many thanks for all your help and organising. Everything was perfect. The trip was awesome I must say. The trip was awesome I must say. The best thing I would like to tell u is your quick service. Our gas was not working and we called your helpline number and one of ur agent showed in 15 minutes, which was wonderful. Other than that everything was perfect. I am delighted that I dealt with you. The cruise was a great success. The people at Carrick Craft were very kind (especially Doris), professional and accommodating. We we were able to collect the boat at 12pm on the Friday which was a great advantage particularly because the weather was good. The boat was entirely suitable for our needs. The only but minor annoyance is the business with the damage waiver. Just like renting a car, one is confronted by this “ultimatum" when collecting the boat. In the end, we paid €120 to cover the excess. Why can’t they include it in the hire charge or have it as an option in the booking process. Or was it there and I missed it. On the plus side, I went through the on-line tutorial and passed the test which saved me the time and trouble of an extended training period before taking the boat. Mind you, I think they might have waived it anyway as I was asked if I had steered a boat before (I had). In any event, I recommend that you highlight to future clients, the benefits of completing the tutorials and taking the test ahead of time. I am delighted that I dealt with you. Your advice and service saved a huge amount of time for me. I would happily deal with you again and recommend you to other people. Your service was excellent, and for this we are most grateful. (i) The showers would not pump out, however, after reading the boats instruction book, we called Le Boat; they responded quickly and sent a mechanic to sort the problem out. It was found that the front shower discharge line was blocked and the aft shower pump filter was clogged with hair. This sort of indicated to me that the pre cruise check wasn't that good, and these sorts of things should've been checked. (ii) Then on the second to last night the water pump started to pump air. We had topped up the water both at Shannon Bridge and at Athlone so didn't consider that we'd be running low on water. Again after checking the Boats instruction book we called Le Boat, and again they responded quickly. In the mean time we took on more water, so that when the mechanic arrived he was able to bleed the system and get us sorted, and to show us where the water tanks were located. I think that the original briefing was disjointed and no one had shown us that there were two water tanks, and where these were located. I think both the people who beefed us thought the other had/would cover the lay out of the vessel. But these were only minor hick ups in what proved to be a great time and a huge experience for us all. We loved our boat and we saw Ireland as we had never seen it before. Our friends from New Zealand were amazed and very happy they had suggested this mode of travel for part of out Ireland visit. The lock Keepers were excellent, helpful and truly professional. The pubs, the people , and the food were all great. I will recommend yourselves to anyone who asks about doing a Shannon boat trip. Thank you for your help in booking our trip on the Shannon. We really enjoyed our cruise. We had great weather, which couldn't have been planned but really helped! Shannon River's service, both prior to and after booking, was great. Your website has lots of very helpful information on the routes, the area, the boats, etc. The interactive map and guidance on cruising times between locations was very useful in planning our route. I would use your service again if we were booking on the Shannon in the future. We had a ball and the best weather possible - we headed up, stayed in Banagher one night, Shannonbridge another - family came by car and we met them in Clonmacnoise for the day. Would certainly recommend it - great holiday. Many thanks to you for all your help and prompt attention at all times. We had a lovely trip and cruised almost all Shannon and Erne from Mountshannon up to Belleek. Transfers and boat administration were perfect. We are still another 1.5 weeks on a tour through Scotland and Ireland. After our return, I will pick a few pictures and send them to you. Unfortunately the trip was over in no time, should have stayed on the river for around 3 weeks! Nevertheless, we all had a comfortable, really good time. Boat was excellent and behaved really well! We had a great time and we were very happy with the boat and friendliness of the team one and all. I would happily recommend directing people your way. Thanks again. We all had a lovely time, and I’m sure we will all be doing it again. (Next time in the summer). Lots of memories made, the week just flew in even although the weather was bad. Boat was fabulous and just perfect for us all. Thank you for all your help. We had a good weekend and very much enjoyed the boating experience. We would consider doing again. Everything was well organised. Just returned to the States last night, but still over the moon! We had an incredible experience of a life time, it exceeded everything I could have hoped for ! Glenda (I believe that was her name ?) was terrific when we arrived a little late, on I suppose her Easter Holiday weekend, but just so nice! Shane was also terrific guy. Based on my conversations with him we mapped out a terrific itinerary completely different than the one that I had tentatively planned before arrival. I've had considerable prior seamanship experience, including 2 years in the USN and he is spot on with his briefings. I will be forwarding to you, with my son's help, suitable photos and commentary for you to use as you see fit. For now, thank you for all of your seamless help on the computer and all of your wonderful staff help at Quigleys !! We will definitely be booking again next year! We had a great time on the river and all went smoothly with the two boats. We will definitely be booking again next year! We had a great time last weekend. That was or 5th time on the Shannon, but the elegance 9 was the best boat we've had to date. The kids really loved it. We would like to thank you for making our cruise so easy and enjoyable , we had such a great time on the River shannon , the staff of "Le Boat " were so wonderful , very helpful and accommodating. The Boat itself was magnificent and of a very high Standard. Thank you once again for all your help and patience with us , we hope and look forward to booking another cruise with you again hopefully next year . It was just an amazing trip woaw so many good memories !! I think we will do it again but more longer than a week this time ! we really had a great time on the Shannon river it was a perfect trip !! nothing to say ?? thank you for everything ! it was perfect vacations !! We had a brilliant time will definitely be booking with you next year everything you need on the boat and everyone so helpful, The process of paying very easy no complaints. Highly recommend you to anyone who asks. Just a quick message to say thank you yet again for your help in booking our trip this year . We had a lovely time and really appreciate your help In getting booking sorted so easily. We want to send a special thanks for Pat from Emerlad Star who was extremely helpful getting us started , it had been 5 years since our last trip so he helped refresh our memory. That's now our 4th trip down and we enjoy each one even more than the last. Thanks for all your help, we all had a fantastic time last weekend. Found your staff to be particularly helpful and welcoming (had the pleasure of meeting Padraic who was an absolute gentleman). We look forwarding to booking another cruise with you and Carrick Craft and will most definitely be recommending it to friends! Thank you for asking, we had a great time, didn't go to far, Leitrim town on Friday evening, Boyle for Saturday night, and Jamestown for Sunday and Sam!!!. Weather wasn't bad a little cool during the nights and mornings, the Sunday was absolutely gorgeous we were up early in Boyle marina to catch the rising sun and the whole day was beautiful, Monday morning was very foggy and we were back at about 10.15am, I had phoned them to let them know. Got good introduction to the boat by Emerald staff, the boat (Crana Shannon star) had a good few outings in it's life with a few little things not working, the showers in the two rear bathrooms were set on cold and could not be adjusted, the heating only worked at one vent in the main dining/living area, a very strong odour in the front toilet/bathroom, the cooker could do with a good service, very low flame, there was a good bit of play in the steering and the upper steering position was missing the transparent wind deflector and stop engine button didn't work, we had no key to open clean water tank but didn't need it. I told the woman at reception about these and she said they would check them out. We still had a great time and will be back again for more, hopefully in a newer boat. Everybody very friendly on the river and willing to help each other out, a lovely way to spend a few days away. Thank you for everything. Thanks Brian we had a lovely time. The boats were great and the weather was fairly good:) Here are two photos. Thanks for your very efficient help when booking. Despite the sudden change of plans at the last minute everything turned out well and we all enjoyed the trip. As it was our first time and the boat was fairly big it was stressful doing our first mooring and perhaps a little longer instruction could have helped we got the hang in the end and would recommend your company again. We are home safe and sound having had a lovely holiday on the Shannon despite the inclement weather. We were very impressed with the boat and your service. The staff were very helpful and pleasant. The only problem we had was getting the heating to work - we were unable. We could have rung base for help but any night we tried to get it going, it was after 7p.m. and next day would be so full on that we forgot to get advice during office hours. So it was probbly our own ignorance but someone might just check that it is working. Overall though it was a great holiday and ye provide a very good service, thank you. Thanks for the good organisation, all worked out perfectly. We had a great time on the house boat! The whole family enjoyed the few days on the lakes and rivers of Ireland a lot. We will surely book a house boat holiday in Ireland again. Next time even for a few days more, so we get to travel further. The cruise was lovely, and the Caprice boat was really nice. Weather wasn't so great at first as it rained a lot but got better as we headed South. The comforters in the rooms were not clean though, you could tell they had just been used. The grill was hooked up for us upstairs but we were unable to use it as all the gas leaked out,not sure how.We paid 47 Euros extra for it and we were disappointed that it leaked and never worked. Other than that, it was a lovely cruise and ground team was very helpful. We had a great relaxing time and enjoyed the cruise very much. Again, thanks for your support and all your bookings. We keep in touch for further cruises. Have a good time and take cake. It was a most enjoyable Holiday. I would say the interior is looking “tired” (Silver Crest) at this stage of its use i.e fabric, cabinets, it was clean but musty. We would recommend more pillows, and very importantly a double duvet for the double bed. We asked about the duvet but they didn’t provide it. The maps and information given was very helpful and the Staff from start to finish were very good. I am sure that we will be back in the future. Thanks, we had a great holiday. Even the weather was reasonably kind. The boat was comfortable and well equipped. The only negative was the pump out toilets. The Aghiver Boat Company was very helpful and accommodating. We had a great holiday. Your staff were excellent especially the receptionist( sorry I forgot her name.. But has glasses) and Pat who done the boat handover on arrival and departure. We are already talking about our next boating trip on the Shannon. Thanks for your email. The booking, value for money, Emerald Star: le boat as they are now known were all great. The weather however let us down badly and unfortunately put a bit of a damper on our trip. There is however one issue that should be addressed and its quite out of your control but maybe yu may be able to get a word in some day. The problem is that the information provided on the facilities available in towns on the river is all hopelessley out of date. The Waterways Ireland booklet and Emerald Star Book all describe wonderful pubs and restaurants that simply do not exist, in some cases having closed over 5 years ago. One example , Drumsna, one small pub and shop in one is all thats left. The information is seriously in need of updating. So much is just not there. Anyway, I found your service great and will book through you nexttime and happy to reccomend your site to anyone interested in hiring a boat. A super trip although we left the good weather in Dublin and had rain for the 3 days but nonetheless all enjoyed the experience. The boat was quite old and with 10 of us on board and no air conditioning the condensation each morning was off the scale but apart from that it was super. No issues to report and we will again return soon. We had a brilliant time thanks. The boat was great fun with more amenities and space than we had expected. It was just the right size for us plus the dog! We couldn’t really find anything negative to say about the trip, our boat broke down on the 2nd last day and the engineer came out very quickly and sorted it out which was super. A couple more bin bags might have been good but I really can’t think of anything else! We will hopefully cruise again with you in the future! We had a most enjoyable holiday although I was very disappointed that there was no DVD player on board our boat because the booking confirmation stated that there would be one. When I raised this issue with the office on Day 2 of our holiday I was simply told that our boat did not have one because not all Elegance boats have them ! It did not seem to matter that our booking confirmation stated that we would have one ! This was particularly disappointing as three nights in a row we also had no television due to no signal! We had a really enjoyable few days on the Shannon, renewing its acquaintance and happy memories of earlier trips, after a gap of about 40 years. We enjoyed some peaceful moorings and lovely evenings at Drumshanbo, the Jamestown canal and just below the lock on the Camlin River at Cloondara - lovely places. The locks and canals, bridges and piers and their wonderful stonework remain a tribute to the quality and elegance of the engineering of bygone days. Everything went smoothly and many thanks for all your assistance in making the booking. We had a fantastic 3 days on the river and got a lot further down the river than anticipated as we made use of all the drivers onboard. I would highly recommend Shannon River due to the service we received from the early check in, to the instruction received on the boat and to the after service provided when our personal belongings left onboard were returned to us. If I had to critique on anything it would be the fuel, we were not given a key to refuel so we could only refuel when we got back to the base at €1.35 p/litre as opposed to €0.93 down the river, this was a huge increase in the cost but we got over it. It was explained to us the reasons why the key was not given out, but we had four more than competent mariners onboard, that knew the difference between a water and fuel tank. Overall, it was one of the best short trips we did and we will definitely be back again to ye. A big thank you to the lady in the office who returned our purse very promptly via post. Your service was really perfect. The boat was perfect. Everything was working. The entire journey was great. Nothing to complain. The weather could have been better. But I guess your possibilities are restricted in this topic. Right? We had an excellent time on the cruise. Polish Seamus saw to us on the first day and got off without a hitch despite none of us having previous experience. We were truly blessed with the weather and we got to visit some great places such as Carrick, Dromod, Roosky, Tarmonbarry, Lanesborough, Cloondara, Athlone, Clonmacnoise Monastery. I was planning to send you an email this week to say thanks for all your help. We had a brilliant time on the cruise, we absolutely loved it. The booking process and service was excellent. I would definitely recommend it to my family and friends. I'll definitely be back to do it again, hopefully every summer! We strongly recommend it to our friends. We had a very enjoyable week and are really glad we tried it. We strongly recommend it to our friends. One small observation. Unlike, say, a rental car, there is no indication of what fuel is in the tank before and after the cruise so it's unusual to be billed for usage at the end when you don't know what you started with. We had a great time and would do again. Only gripes if I had any would be where to get rid of rubbish in one or two places though an amazing lady in a shop in killaloe took ours so maybe knowing where the bins are would be good eg. mount shannon. I also mentioned to the cruiser company that the water hose on the boat was about 10-15 feet short. Only very minor things so. We had a marvellous time and really appreciate all of your very kind assistance and advice throughout the booking process. Looking forward to next year !! I'll be sure to get in touch with you then ! We had a great trip and the picking-up / dropping off the boat was all seamless. We had a minor mechanical problem with the boat on the first day but Carrick cruises came to the rescue as soon as we phoned them and we were on our way again. One point I have just noticed is that we got a cleaning bill of €100 which I thought was a bit excessive. I admit that we had left some dirty dishes but we had attempted to wash them only to discover that we ran out of water. We emptied all the rubbish etc. We may not have folded the linen but this is removed anyway for cleaning, would I be correct? To their credit they had asked for a deposit of €1,000 but when I mentioned that we thought it was a choice between that and the €220 waiver they agreed to go with the waiver. Which was lucky as this is what we had budgeted for. Just some points of note. thank you. We very much enjoyed our cruise from Banagher to Carrick and back. Lots of fresh air (not too much rain!). Highlights were visits to the Purple Onion at Tarmonbarry, Athlone Castle, and Carrick. We had a wonderful holiday, even better than last time, we saw lots of new places and thoroughly enjoyed each one. How can I write a review for your website? Your service was excellent as advertised and I thoroughly enjoyed the cruise. The boat although clean, also needed a "revamp", cracked broken tile in the galley and also fire damage to the stove surround. The boat was definitely the slowest on the river, one of the mechanics admitted that thy were waiting for a part. This made planning a day difficult as the times and distances supplied on the guide were impossible to achieve. We had a lovely time on the shannon. We had a lovely time on the shannon. Compliments to yourself first of all you were very helpful. Doris in the office in carrick was so lovely and the guys on the boats were also very friendly. We went to Boyle (Clarkes restaurant was actually closed on the Monday so that was a pity) lough Key was great. Went to clondra / Richmond harbour and cycled the canal to longford which was great but nobody seemed to know about it and the cycle paths werent really highlighted anywhere which is a shame. Considering we had the bikes with us more info on locations with possible cycle/walking paths would have been great. We used a little brochure from the office that had descriptions of the villages but not much info on cycling/walking options. That said we probably were winging it a little we didn't do a whole lot of research beforehand. Got a lot of info from lock keepers the guy at Rooskey lock was great, was also very helpful teaching us boat stuff etc. The cottage restaurant in jamestown was gorgeous also. What a treat. Not much on trip advisor about shannon boat trips either which we tend to use a lot when we land somewhere without a plan! All in all had a great time and would def consider doing it again maybe with friends and a bigger boat now that we might be a bit more confident. we had an absolute fantastic time! Thank you for your email, we had an absolute fantastic time! The gearbox on our original boat broke down on the second day, but the staff were brilliant in supplying us with an alternative boat in no time at all. We are a bunch of old pals that have boated together every year since 1992, but this was one of our best years yet. We will certainly be back to do the rest of the wonderful Irish waterways & meet more of the most friendliest people in the world. It was exactly what the doctor ordered. I did not expect it to be so nice. As always service was top notch! The best holiday I ever had in Ireland. My booking experience was excellent. I would like to thank Brian for all his help with our booking. We had a lovely time on the Shannon! All went smoothly and can't wait to go again! We had a fantastic time, and were very lucky with the weather. We had a great time in Ireland. Our trip was really great. We very much enjoyed our short cruise. We had a great holiday and appreciated your service. I’ll certainly be recommending Shannon River to my friends and family. The only disappointment with Carrick was the additional payment of €120 we became aware of as we checked in to reduce the insurance excess from €1000 to €100. That felt like a bit of a scam - including only insurance with a €1000 excess in the quoted price was a bit misleading by Carrick - it’s not what car hire or similar companies do. I paid it because I was in a hurry to check in - need to read the small print in advance next time!! But this is a a disappointment with Carrick, not with you. Thanks for arranging our hire - we will be in touch when we book our next river trip in Ireland. We had and absolute blast! We all had a super time on the Shannon. We had a great time on the river. Overall very happy with your service thanks. It was a pleasure dealing with you from the start to finish. It was the highlight of the holiday! We had a brilliant time, thank you. Overall -a really good trip. I couldn't recommend shannon-river.com more. I would recommend you and your company to all. We really appreciate everything you and the Portumna staff did for us. We were very satified with the comfort on the boat and your services. We had one of our best holidays ever with one of your boats. Yes we had a really good time. I thank you for help you make our trip so hassle free and memorable!! Very enjoyable. Thanks for all your help. Thanks a mill will definitely be using your services again. For us the cruise on the Shannon was a marvellous experience. Had an absolutely brilliant holiday. It has been a great experience and all went very smoothly. We had a very great time, indeed. We really enjoyed our time on the Shannon and would definitely do another holiday like this. We had a wonderful time on the boat. We had an absolutely fantastic time on the Shannon. It was the most wonderful few days on the Shannon. We had a great time and we were blessed with the weather. Wonderful part of the world. Was a great time we had. Probably the best holiday we have ever had. We did have a great holiday. We had a wonderful time on the river. We Would Book Again and Would Do It Through You. We Have Been Very Satisfied With Your Services. We Had a Great Time and All Went Very Well. I’d Certainly Do It Again. Everything Worked Out Very Smoothly. We had a brilliant time on the Shannon. The best vacation I have ever taken. would go again next year. We had a great time on the cruise. It all worked so well. We had a wonderful family holiday. I can only say that it was an absolutely perfect weekend. All good things to report. We had an absolute ball on Lough Derg last week. We had a very pleasant few days, thank you. We had a great time, many thanks. We had a brilliant time on the cruise! Everything you arranged for us worked out perfectly. We had a ball thanks! My 2 German friends and myself really enjoyed the break. Everything worked out perfect. No complaints. We had an absolutely amazing trip and were very lucky with the weather. We were both extremely impressed. You were right, the Vision is a great boat! We really enjoyed the trip a lot. Thanks for all of your help with the boat. The boat was fantastic and the staff were very pleasant and very helpful. We will be back again at some stage. Everything was fine, communication was uncomplicated and especially the weather was great. Book a cruise of 3 nights or more on selected Emerald Star boats and get 30% off. Book a one-way cruise on a Classique from April 27th and get 40% Off. The travel guide is available free of charge due to the travel agents commission taken on boat hire services on the river. 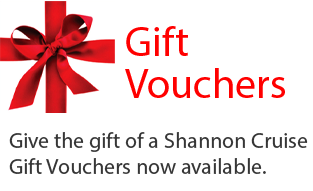 Feel free to browse the site at your leisure - all we ask is that if you are taking a boating holiday on the Shannon, you book it through the Shannon River web site.